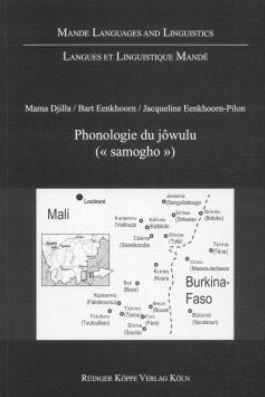 Jôwulu, which is also known as “Samogho”, is a West-Mande language and therefore belongs to the large Niger-Congo language family. It is spoken in South-Eastern Mali and South-Western Burkina Faso by the Jori people. There are about 10,000 to 15,000 speakers in both countries. The phonological sketch is proceded by a brief demographic, ethnographic, and sociolinguistic introduction. The main part of the book describes the phonemes and the morphophonological processes as well as the most important phonological features like vowel harmony and the tonology of this language. The sketch is concluded by a French-Bambara-Jôwulu wordlist which also presents the phonetical realisation beneath the orthographical representation. One aim of this contribution is to help the Jôwulu speaker to choose a homogenous orthography. Another aim of the authors is the enrichment of mande studies and to increase the knowledge of Mande languages.